I’m back tonight with something new I’m so excited to share! 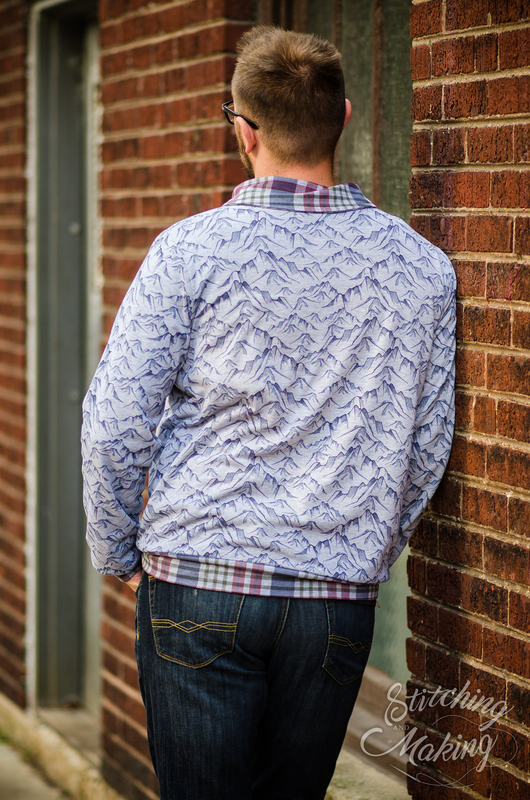 The CLUB custom fall line by Raspberry Creek Fabrics is absolutely phenomenal, but this mountain print and the coordinating plaid are my top favorites by far. 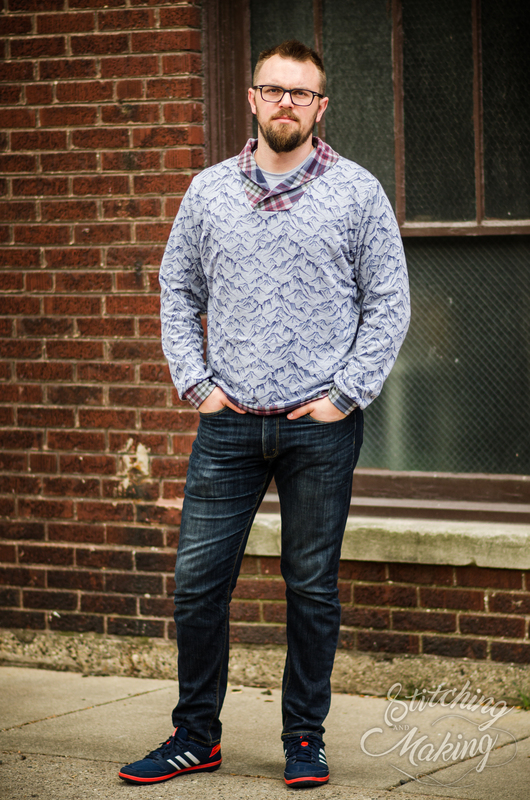 It’s another Finlayson Sweater by Thread Theory! 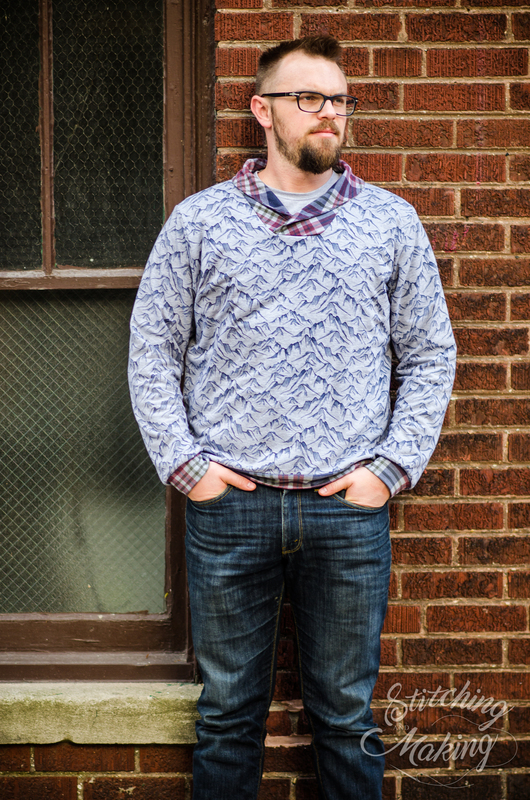 As you may recall, I sewed two of these earlier this year and discovered that I loved the pattern a lot. It’s a simple sew, but such great and impressive looking results. The collar is a little different and really steps things up a notch. 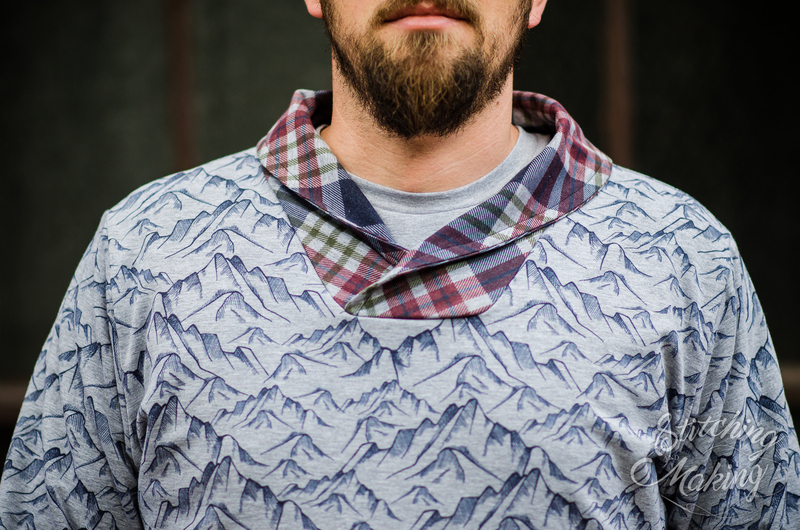 As soon as I saw the mountain fabric, I knew I needed to make this exact shirt. 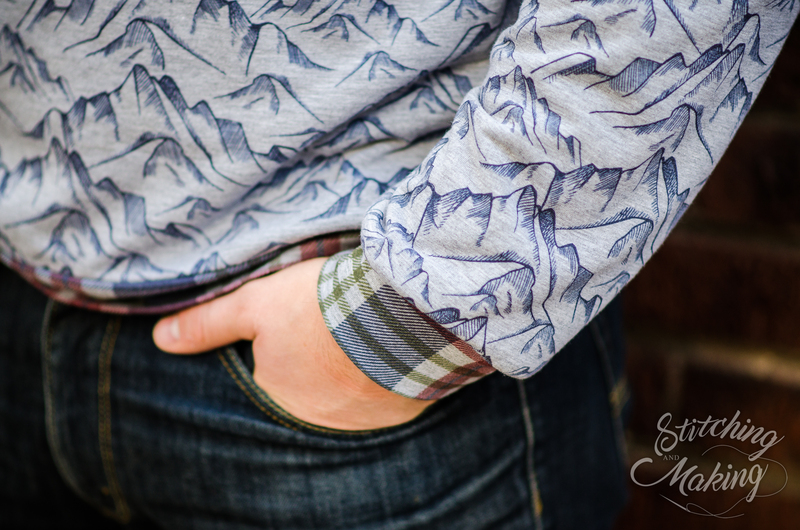 The simple nature of the mountain design really lends itself to the rugged, outdoorsy feel of this pattern. Doesn’t Brian look like he stepped out of an Eddie Bauer ad? Haha…but seriously. I can’t get over how this turned out exactly like I imagined! Here’s the thing. 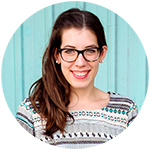 I knew that I wanted this shirt to be more of a mid-weight top, warmer and thicker than standard french terry. This is because the pattern really does lend itself to something more structured and stable, where the collar piece attaches especially. So, wanna know what I did? 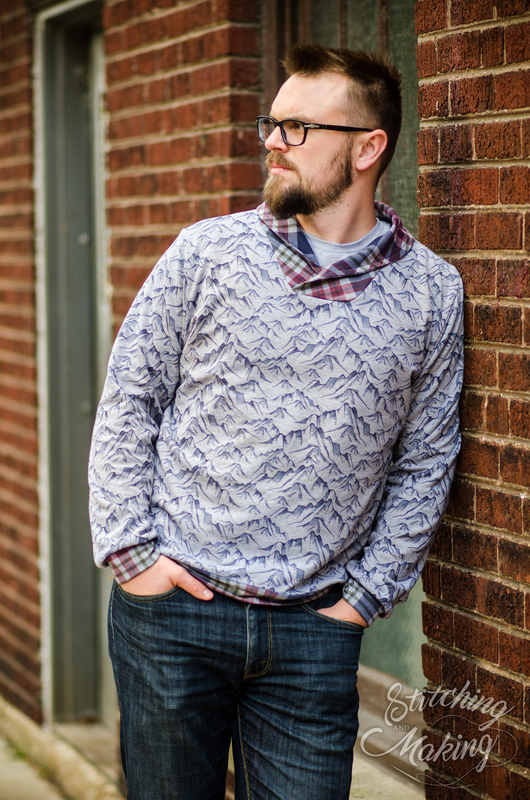 I used cotton lycra for the print and I lined it with Raspberry Creek solid french terry! I knew that my yards of solid charcoal stashed away would be put to good use. Yes, this takes double the fabric to make, but it’s just sooooo cozy and worth it! 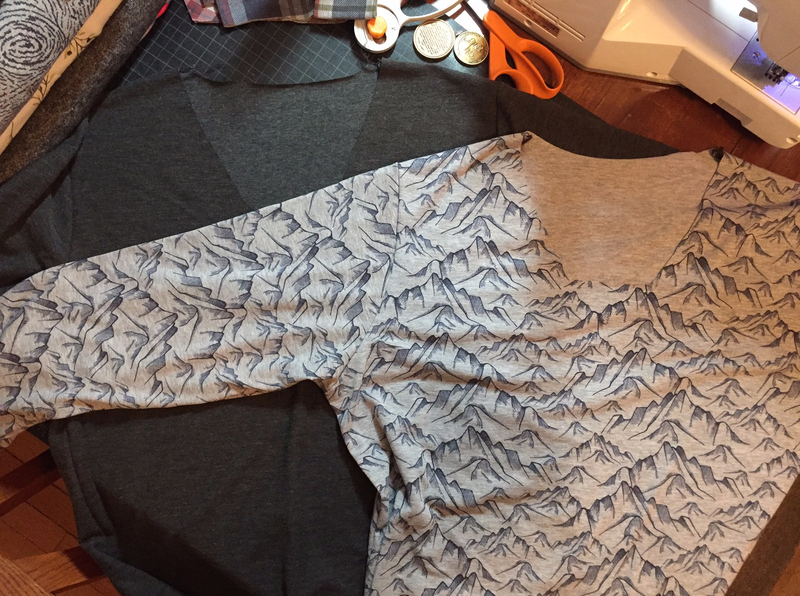 Cut out the bodice and sleeves with both your main fabric and lining. Sew the shoulder seams, attach the arms, and sew the side seams. 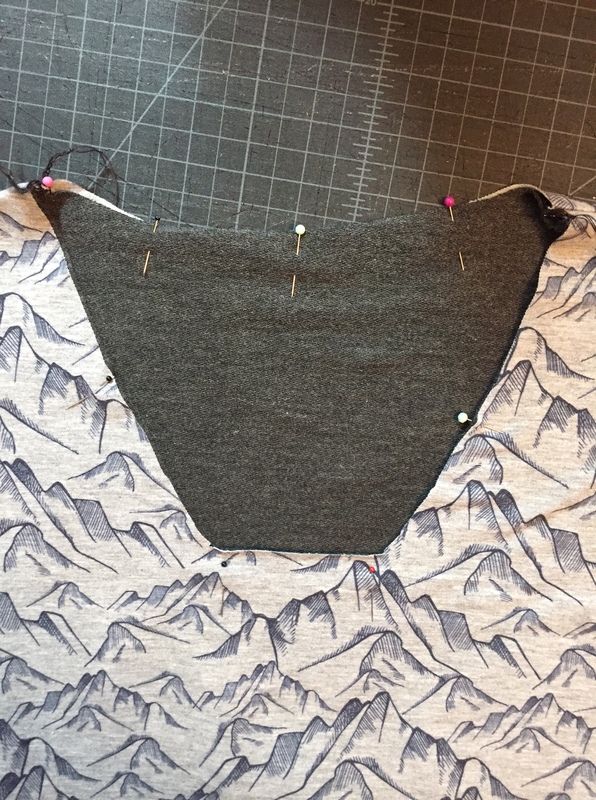 Make sure your lining has the fabric you want on the inside facing out. I wanted the loopy side towards the body, so I sewed it “inside out” with the seams on the smooth side. Now, slip the lining shirt inside the main fabric shirt with wrong sides together, lining up the seams and edges. You could baste them together here on the raw edges, but I like to live on the edge. 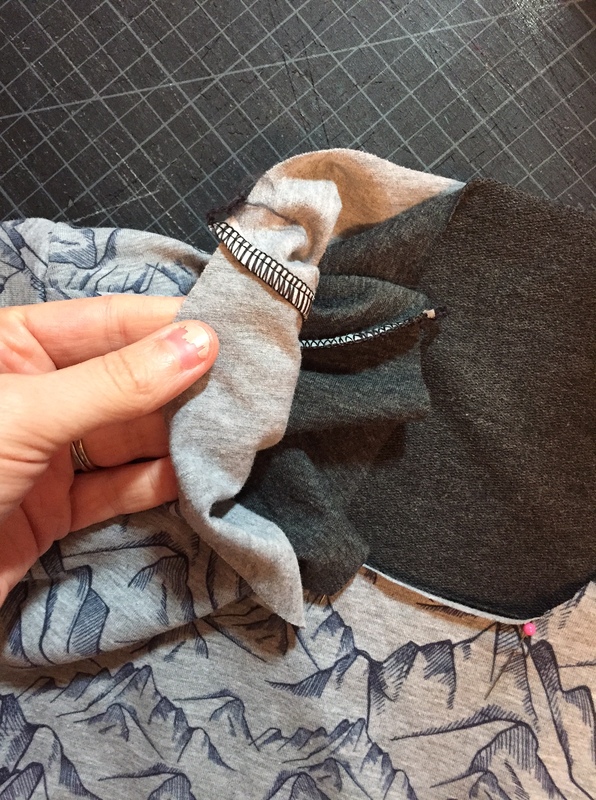 Attach your sleeve cuffs, band, and collar to both the lining and outside shirt edges, making sure to catch all four layers as you stitch. This fabric is just stunning in person. I’m obsessed with the heather gray base, because it gives it just so much more texture than a regular solid. The crosshatching design on the mountains is so simple and classy. 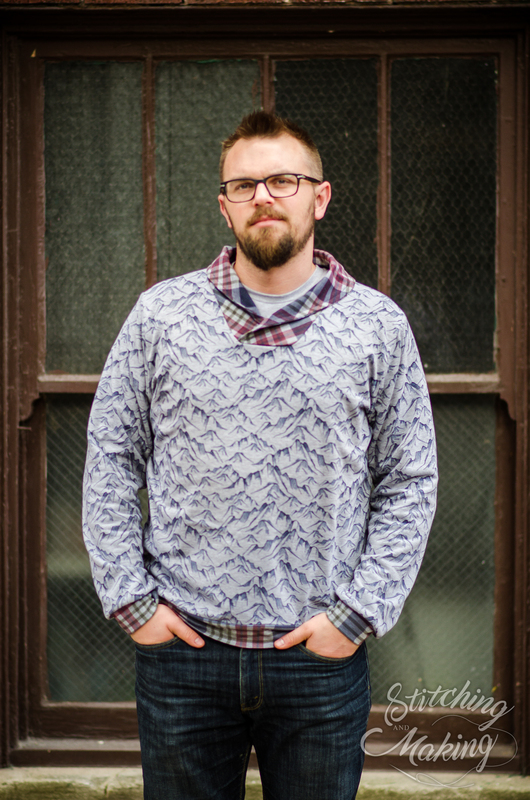 Not to mention the plaid, which is also printed on the heather base as well. This is such a nice touch, where you can see just a little bit of the heathering coming through in the background. It’s so versatile too, I already have plans for at least one more idea with the plaid. Just perfection all around! Stock up on both of these fabrics here! I’ll be back soon with a few more makes from the fall collection as well!